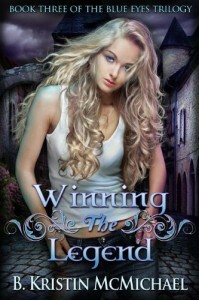 Winning the Legend was a spectacular ending to this trilogy! I absolutely loved the interactions between Ari and Andrew, they're just the sweetest couple. Turner, Devin, Molina and Thomas definitely brought their A-game for this ending. We finally meet the other clan leaders when they issue a challenge for Ari's hand in marriage. These men might not want from Ari, what she thinks they have in mind though. All of the facts about the legend are finally uncovered and Ari has the option to either act or ignore the legend completely. While all of this is going on, all of the clan heads are fighting for the right to marry Ari, even though Andrew is her mate! There are tons of twists and turns throughout this story, with betrayals and new allies throughout. I'd definitely recommend this book to anyone into a great YA love story, Twilight has nothing on The Blues Eyes Trilogy!